A Perfect gift for that Special Occasion. These Sets Include a Realistic Looking Doctor Bag Gift Box. We have lots of combinations to choose from, some Sets include Kids Lab Coats, Kids Scrubs, Scrub Caps, or Stethoscopes. All of our Boxed Gift Sets are Unisex for both Little Girl and Boy Doctors. Scrubs Set, Lab Coat, Doctor Bag, and Stethoscope for your Little Doc! Scrubs Set, Doctor Bag, and Scrubs Bear for your Little Doc! 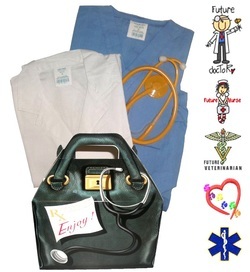 Scrubs Set, Cap, & Doctor Bag for your Little Doc! Scrubs Set, Lab Coat, Doctor Bag, Stethoscope. Embroidery Design Included! White Lab Coat, Doctor Bag, and Scrubs Cap for your Little Doc! Scrubs Set, Lab Coat, Doctor Bag, Stethoscope, Scrubs Bear & Cap for your Little Doc!